We have a commitment. In December 2009, the Environmental Protection Agency (EPA) concluded that greenhouse gases (GHGs) like carbon dioxide and methane are hazardous to public health and welfare. This legislation moved forward with support from vast scientific evidence and review that validated the decision to impose the admittedly costly regulation. Ultimately, the positive health benefits outweighed the negative financial costs and with the Endangerment Finding under the Clean Air Act, the EPA and United States government is now compelled to actively address the problems of a warming planet and climate change as induced by GHG emissions. In this instance, science played a pivotal in pushing this legislation forward, offering extensive evidence via the technical support document “Endangerment and Cause or Contribute Findings for Greenhouse Gases under Section 202(a) of the Clean Air Act.” This document and commitment to GHG reduction is now permanently part of the record in the Federal Registrar. Given this permanence, future legislation seeking to modify the law and refute the basis of claims in the Clean Air Act must also refute the science under the technical report. It is clear that science is truly a powerful tool in legal frameworks and should be employed responsibly in the impact it can have on public policy. Unfortunately, training under the scientific disciplines tends to focus on technical rigor and the pure pursuit of knowledge, setting aside discussions on ethical conduct and the obligations scientists have towards society at large in “ethics seminars” advertised as bureaucratic requirements, unimportant to a scientist’s ultimate research agenda. Thus, this paper seeks to reconnect the scientific community’s commitment to public policy and motivate readers via multiple examples of where science has a human impact today. We will focus on interdisciplinary scientific contributions to natural resource management and environmental change via the Global Change Research Act, Clean Air Act, and National Environmental Policy Act but readers should be fully aware that there exists a multitude of other priorities in public policy relevant for all academic disciplines. Regardless, in all cases of scientific public policy, it is of great paramount to continue insuring sound and well-documented science so as to maintain public trust in the objectivity of science. When the science is sound, lawmakers will have an immovable foundation in the legal frameworks they create, thus keeping regulations upheld when challenged. First and foremost, it is important to recognize that the United States has a consistent history of supporting and funding basic and applied science innovations over multiple generations. Reiterated by Bush in Science, the Endless Frontier1, President Roosevelt stated in 1944 that science is able to “create a fuller and more fruitful employment and … life,” leading towards the formal creation of the NSF with the National Science Foundation (NSF) Act of 1950. The Foundation sought to maintain the momentum of scientific invention following the war and codified into law its commitment to basic science research, education of youth, collaboration with domestic and foreign research entities, and need to regularly appraise the impact of science on industry and public welfare2. Recommitments to these ideals have taken place in multiple forms via other statutes like the Global Research Watch Program3, which aims to continue promoting American excellence in science internationally, especially towards national defense. Important in current events, the Global Change Research Act of 19904 compels federal agencies to cooperate both externally and internally on research pertaining to global climate change as well as require a regular assessment report on global change research to be submitted to the Office of the President and Congress, which the recent 2017 Climate Science Special Report satisfied. Beyond the obvious argument that most academic and industrial research in the U.S. is funded by tax payer dollars, these public laws and statutes, as well as many others, provide a clear basis for how science is maintained as a topmost priority in government spending and why scientists should take more active roles in its application to public policy. The clear commitment by the United States to support science additionally implies certain desired outcomes and results from this support. Repeated from the act founding the NSF, the benefits of science are not only to improve technology but also improve public welfare. The improvement of public welfare is not simply a byproduct of technological innovation but an active goal of legislative powers. And in many cases, lawmakers have actively utilized science-based resources to improve proposed policy and inform enforcement mechanisms in regulations. For example, in Massachusetts vs. EPA12, the EPA contended to not regulate GHGs like carbon dioxide emitted from mobile sources and automobiles, since it was not covered under the Clean Air Act. However, the supreme courts remanded the case to the EPA, requiring them to review their rationale on the regulation of GHGs. Thus, the EPA produced the Endangerment Finding6 in 2009, the science-based rationale demonstrating the harm GHGs have on public health and therefore legitimizing the large expenditure, approximately $65 billion5, required to regulate GHGs. This also satisfied the review process for Executive Order 12866, which requires any policy with “significant regulatory action” to be submitted to the Office of Management and Budget. The 210-page document includes comprehensive data and plots including emissions of GHGs over time, studies on GHG lifetimes, GHG impacts in the atmosphere, associated confidence levels of understanding, and impacts on social systems like energy demand, public health, and national security6. The report clearly organized impacts relevant to diverse stakeholders according to geographic region or economic industry. This comprehensive report contributed to the passing of the amended Clean Air Act as it is today and thus creation of the National Ambient Air Quality Standards (NAAQS). Overall, cost-benefit analysis has justified this costly program by showing that the Clean Air Act has saved now about $2 trillion and prevented roughly 230,000 early deaths5. Though this cost-benefit analysis was not available until after passing of the act and amendments, the science that went into outlining the impacts of GHGs and extent of benefits realized by their reduction remained essential to the case’s ruling. Though exact budget costs were not initially predicted, science still convinced legislators of the need to pass the act and amendments. Overall, the scientific enterprise went full circle wherein long-term government funded research led to the production of reliable data and recommendations for legal policies and technological progress. Moving forward, government and law enforcement agencies will continue to rely on the scientific enterprise for the public good. As in force now, one of the first laws that serve to protect our environment is the National Environmental Policy Act (NEPA) of 1969. The primary function of this act is to establish a Council on Environmental Quality which requires review of significant land or resource utilizing projects to be subjected to environmental impact assessments with analysis of potential alternatives prior to approval of said projects. This is aimed to preserve and mitigate the human impact on the natural environment to satisfy, as states in the act, the “requirements of present and future generations of Americans7.” Many of the assessments are often informed by engineering and science-based firms who are well equipped to analyze and elucidate more precise data-based impacts on the environment from proposed projects. Though exceptions exist under NEPA for projects to forgo an environmental impact statement (EIS) if an initial environmental assessment finds it unnecessary or if the project falls under certain categorical exclusions like for oil and gas industries, as defined in the Energy Policy Act of 2005, prior cases like “Friends of Back Bay vs US Army Corps of Engineers8” demonstrates a successful appeal for requiring an EIS. An important factor in this particular case is the opportunity for public comment in legal proceedings. Following issue of the permit without an EIS, more than 350 public comments were submitted to the US Army Corps where nearly all opposed the project. Noted in case summaries were specific comments by scientific agencies like the EPA which demonstrated the significant environmental impacts not addressed by the Army Corps. This, as well as the clear language in NEPA requiring EISs for significant environmental projects, led to the courts requiring the Army Corps to perform an EIS for the project. All in all, comprehensive environmental impact assessments will continue to be required for many future projects as humans continue to change their lived environment. This inevitably will always lead to a demand for well-trained expert scientists and engineers to perform these assessments to adequately serve the public’s best interests. Now we have seen a few contexts where science and federal agencies have played a role in public decision making. Still, science will never be done in its ever-present goal to improve other’s lives and address global problems. Just as is outlined by the National Academy for Engineering9, there remains many 21st century “grand challenges” for technologists and researchers to solve today, including artificial intelligence, access to clean water, and carbon sequestration. The goal here is to respond to issues intersecting with poverty, sustainable modern cities, climate change, efficiency in the workforce, and others. Any professional engineer should be aware of these goals and are likely actively contributing their work to address these problems. For the topic of climate change, this has resulted in numerous studies on adaptation and geoengineering, or methods to directly alter the lived environment, usually in order to change the climate to a state prior to global warming. In a recent discipline review article of geoengineering by Caldeira10, many strategies for addressing climate change are highlighted and compared. However, Caldeira does explicitly avoid the ethical and political discussion on climate change solution strategies, citing that it is “beyond the scope of this review of the basic science.” This is unfortunate as there are many other studies, especially in fields of economics, where cost-benefit analysis studies are performed and serve to best inform budgetary decisions of governmental bodies seeking to implement proposed climate related solution strategies. One example is Burke’s research on anticipated changes to GDP given climate change, a mostly negative trend except in Russia, Canada, and other northern countries. These ideas in economic analysis could be coupled with Caldeira’s highlights on reforestation as one the fastest and most effective means for carbon sequestration, or removal of carbon dioxide from the atmosphere. Already, it is public knowledge that trees and biological flora systems take in carbon dioxide as part of their life cycle. Therefore, it is simply a matter of clear science communication and economic analysis at global scale to connect the dots and showcase the feasibility and impact of potential geoengineering projects alongside other carbon reduction initiatives. As a starting point in the United States, awareness of the previous recommendation for reforestation and the Wilderness Act’s commitment to preserve uninhabited natural habitat, a foundational argument can be made to defend and expand current wilderness land so as to support needed climate change mitigation efforts, thus preventing potential interests seeking to eliminate wilderness areas for short term commercial gain or other endeavors. Notably, some more radical approaches have focused on assigning personhood to natural entities like rivers, forests, and mountains11, so they can have similar rights in court proceedings like corporations do as person entities. Admittedly, for this approach philosophers will need to join the discussion. Overall, science has a pivotal role to play in public policy and how the government chooses to pursue avenues of technological advancement. Yet, the scientific enterprise, by its own organizational structure and how science is performed, will never clearly prescribe one solution as being the best, let alone even being correct. Scientists always see potential for future improvements in research and will debate amongst one another why one idea is wrong and another is right without an end in sight. With the amplifying ability of today’s internet, that is why discussions contesting the validity of climate change continue to this day since those in disagreement from the majority can still maintain a substantial voice in cyberspace and science itself encourages the continuous questioning of all ideas. The only thing certain in science is that there is more science to do. Regardless of this fact, public policy takes place in the now. The outside world can’t always wait for science. At some point, scientists must see the purpose of their endeavors and take the greater risk of letting their ideas be known to the public. Taking risks in the lab means nothing if the science is never able to be tested in the real world. If you really want to take risks as a scientist, commit to doing sound science not only under the eyes of peer scientific review, but also under the eyes of public scrutiny and public policy review. For science is not just for the scientist to learn, but for the public to learn too and be better for it. Bush, V. (1945). Science, the endless frontier. A report to the President. Washington: U.S. Govt. print. off. United States. (2012). National Science Foundation Act of 1950. Bethesda. MD: [ProQuest]. 10 USC. Sec 2365. Global Research Watch Program. 2011. Legal Information Institute. 40 USC. CFR Chapter 1. 74 FR 66495. Endangerment and Cause or Contribute Findings for Greenhouse Gases under Section 202(A) of the Clean Air Act. 42 USC. Sec 4321. National Environmental Policy Act. Caldeira, K., Bala, G., & Cao, L. (n.d.). The Science of Geoengineering. Annual Review of Earth and Planetary Sciences, 41(1), 231-256. MASSACHUSETTS v. EPA. (No. 05-1120) 415 F. 3d 50. April 2, 2007. reversed and remanded. 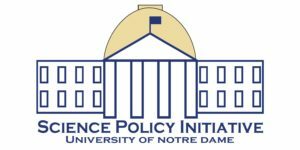 Inspired by partner schools and through our membership with the National Science Policy Group, we will be adding a monthly science policy blog space for SPI members to contribute their thoughts and ideas about present and ongoing discussions on recent issues relevant to science policy. We anticipate contributions to this space will come primarily from our monthly topical meetings where one SPI member will be asked to contribute their research on a timely issue as well as new knowledge gleamed from our public meetings. If you are interested in contributing your own science relevant post to our site, please message scipolnd@nd.edu for more info. Thank you and we look forward to bettering our public discourse on science policy!